It was like a pair of scissors cutting into my intestine, that was what it felt like to be hungry when I was a child. In the school holidays I used to get up early in the morning to take the animals out into the bush. On days when there was no food, apart from the pain in my belly I felt dizzy. During the school year I’d walk 10 kilometres to school. There were six of us children but I was the one chosen to go to school. It was some German aid workers who suggested to my parents that I’d benefit from formal schooling. That was in the 1970s. 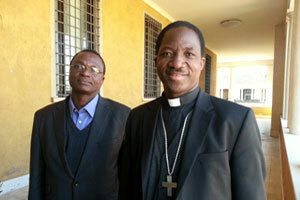 Forty years later, I travel to dioceses in Niger as part of my work and I meet so many people who have nothing. There’s been no rain, when the rain did come it was so heavy and violent that it washed away the crops. I went to a parish in Dobel in the west of Niger in December and people had nothing. I wondered how they were going to survive until January. We gave them food but it’s not enough. The fields need rain and the farmers need their crops to grow. People end up migrating to towns from rural areas. They try to sell anything they can find just to get by. There are four million people who are desperately hungry in Niger now after poor rains which affected the harvest. If we don’t do anything, that will double to seven million within two months. That’s half the population of the entire country. Over 160,000 hungry people will be helped during the six-month project. Food rations, boosting the nutrition of mothers and babies, help to farmers. In the Dosso, Maradi, Agadez, Niamey, Tahoua, Tillabéry and Zinder regions.